Sarah Stokey pulls onto Puntilla Lake with a team of dogs that has been gradually climbing up the Alaska Range. Stokey grabs three heavy drop bags full of supplies and parks her dogs for a rest. She’s in good company. Except for Nic Petit and Pete Kaiser, who flew through mid-morning, almost all of the teams at the front of the pack are taking a break. The checkpoint at the Rainy Pass Lodge has a festive atmosphere. The frozen lake is cluttered with planes and helicopters that bring in tourists for day-trips, the rustic wooden buildings ringed with picturesque mountain peaks. It’s not where Matt Hall would have chosen to stop, but he wanted a veterinarian to check out a dog’s toenail problem. “Little noisy, but they rest good,” Hall said. 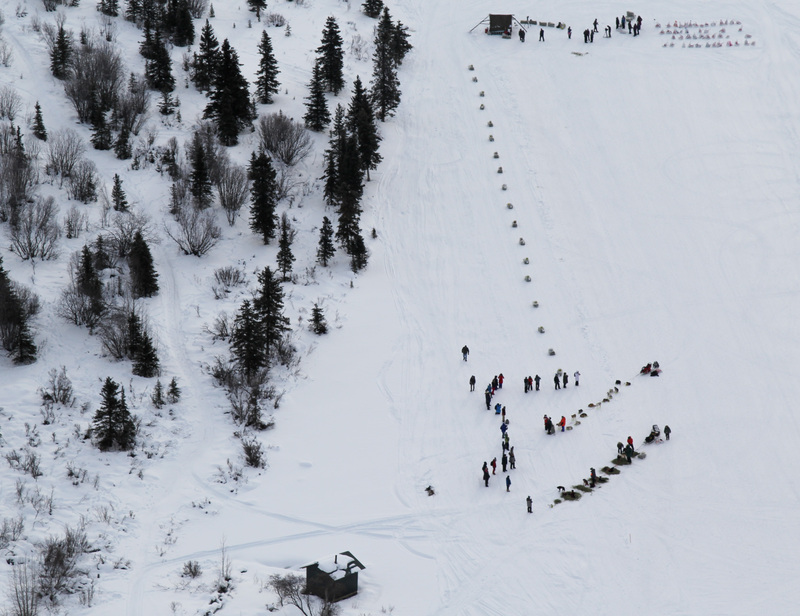 Hall came off the Yukon Quest a few weeks ago, and likes camping out with his team beyond the hubbub of checkpoints. And he knows that enough teams are likely to stop here that he can keep toward the front of the pack. “It’s definitely an advantage being towards the front early on, just because of that, ya know you get 20,000 dog feet over it and 50 sleds and it starts getting softer and softer as the heat of the day comes on, too,” Hall said. A hard-packed, smooth trail that gets punchy and pulverized after heavy traffic is slower, and more effort for the dogs. In the cool early hours, before many mushers had gone over, Linwood Fiedler says the trail heading up toward the Rainy Pass checkpoint was something to behold. Fiedler also wants to take advantage of the mid-day warmth, rest his dogs while the bright sun and relative warmth soften the trail. After the lodge, the route keeps going up, until it hits Rainy Pass itself. The trail weaves back and forth over a river enveloped by steep mountain peeks on both sides. This year trail crews had to build 20 bridge crossings over sections of open water. From Puntilla Lake, it’s 35 miles up and through the pass to the Rohn checkpoint. It’s a kind of dog driving that requires some finesse. “I’d have to say my team is pretty controlled anyway,” Jessie Royer said. Royer is in a good mood, strawing her dogs. It’s not just the pass that’s a challenge, she says. What follows are the drops and turns of the Dalzel Gorge. And then the bumps and tussocks of the Buffalo Tunnels and Farewell burn. Royer’s approach is to rest and charge up her dogs before embarking on the hours up and over the pass, but keep them moving, winding down their power until all the technical stretches are behind them. It’s a stage in the race when there’s strategy not just in reading the trail, but knowing how to use a dog team’s relative restedness or fatigue to help navigate perilous terrain.